The increasing use of pesticides is a major health issue. There is therefore a need for improved analytical methods and more knowledge on the interaction of pesticides with living organisms. Here, we developed the analysis of profluralin in water and soils by cyclic voltammetry, square-wave voltammetry and square-wave adsorptive stripping voltammetry. We also studied the interaction between profluralin and double-stranded DNA. Results of cyclic voltammetric studies indicate that the reduction processes have an irreversible and adsorption-like character, as a possible consequence of the reduction of nitro groups of profluralin. Quantification was found linear from 60 to 800 nmol L−1 with a detection limit of 17 nmol L−1 using square-wave adsorptive stripping voltammetry. Results of interactions with double-stranded DNA from salmon sperm revealed that profluralin forms a complex with DNA by electrostatic binding. Values of Gibbs free energy confirmed that formation of profluralin–DNA complex is spontaneous and favourable. The online version of this article ( https://doi.org/10.1007/s10311-019-00865-1) contains supplementary material, which is available to authorized users. Herbicides are a specific type of pesticides which are used in agricultural, forest and wild-land ecosystems to reduce or to inhibit the normal growth rate of weeds. Since they can be accumulated in crops, the problem of bioaccumulation of toxins in the environment and in the food chains is significant (Samghani and Hossein Fatemi 2016; Oller-Ruiz et al. 2018). Numerous herbicides can cause different types of health effects ranging from skin rashes, through respiratory problems or even to birth defects or cancer. 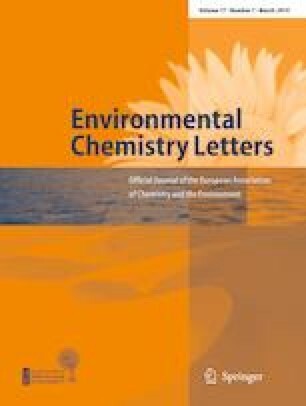 Thus, the analysis of herbicides and their impact on environmental pollution is an important field of analytical chemistry research (Valle et al. 2018; Gill et al. 2018). Herbicides belonging to the group of dinitroanilines are extensively used in the selective control of weeds due to their broad spectrum of function, chemical stability, efficiency of the action and relatively low direct toxicity. An example of such compounds is profluralin (N-(cyclopropylmethyl)-2,6-dinitro-N-propyl-4-(trifluoromethyl)aniline, Supplementary Material, Fig. S1). Profluralin is used for preemergence control of annual grasses and small-seeded broadleaf weeds, especially in cotton, soybeans and peanuts, but also in sunflower, cabbage, cauliflower, tomato and others. This herbicide kills weeds by penetrating their roots and stems (Xia et al. 2014; Helling 1976). The decomposition of profluralin occurs in soil (Carringer et al. 1975; Camper et al. 1977), water (Kearney et al. 1977) and by microorganisms (Stralka and Camper 1981). Depending on type of soil, a half-life of this herbicide is approximately 80 to 160 days. Since profluralin is strongly adsorbed to organic matter, it could be transferred into agricultural products such as vegetables, fruits and cereals with potential risk of food pollution. Profluralin is very toxic to honeybees and fish when placed directly in water. Fortunately, it is practically non-toxic in small doses to birds and mammals (EPA 2016). In case of large doses in the rats’ organisms, ataxia, decreased respiratory rate, salivation, prostration, hyperactivity or dyspnea was observed. Overexposure to profluralin may cause irritation of skin, eyes and mucous membrane for humans (PMEP 2007). To date, analytical methods based on mostly gas chromatography–tandem mass spectrometry (GC–MS/MS) were utilized for the determination of profluralin in plants (Taha and Gadalla 2017; Hou et al. 2016; Bernardi et al. 2016), honey (Shendy et al. 2016), nutraceuticals (Nieto-García et al. 2015; Páleníková et al. 2015) and cereals (He et al. 2015). Traditionally, mercury electrodes were the most widely used sensors in electroanalysis due to their excellent electrochemical properties. To reduce the amount of toxic mercury needed for the analytical procedure, the mercury film electrodes on various conductive substrates were developed. Since the mercury film electrodes have a larger surface-to-volume ratio than conventional mercury drop electrodes, obtained stripping signals are more intensive and sharper because of faster diffusion of the analyte within the thin mercury film (Economou and Fielden 2003; Smarzewska et al. 2018). Therefore, sensitivity and selectivity of the detection are greatly enhanced. Moreover, simple construction, low costs and possibility of mercury film regeneration resulted in general acceptance of film electrodes as effective electroanalytical tools. Some of the mercury film electrodes inconveniences related to preparation and their use were solved by a renewable, silver amalgam film electrode designed by research group from Cracow (Baś and Kowalski 2002). The principle of this working electrode is based on formation of a cylindrical amalgam film at the surface of silver wire, which is refreshed before each measurement via pulling the wire through reservoir of silver amalgam. Very small consumption of silver amalgam not exceeding 10 μL and long-term stability with more than two thousand measurement cycles (Baś 2006; Piech et al. 2008a) make this electrode design environmentally friendly and consistent with green chemistry demands. Excellent properties of silver amalgam film electrode have been successfully utilized in the determinations of metals (Baś 2006; Piech et al. 2008a, b), vitamins (Baś et al. 2011), drugs (Smajdor et al. 2015; Smarzewska et al. 2017a, b), hormones (Smajdor et al. 2016a, 2017), steroids (Smajdor et al. 2016b) and pesticides (Smarzewska et al. 2017c; Guziejewski et al. 2017, 2018). Initial experiments revealed a distinct electrochemical activity of the profluralin and enabled its determination at the glassy carbon electrode (Smarzewska et al. 2017c). Herein, we continue the profluralin investigation using silver amalgam film electrode with the aim of improving the sensitivity and linearity of its electrochemical detection and of separating overlapping signal, which was not possible at glassy carbon electrode. Likewise, the square-wave voltammetry technique was used due to its excellent features, such as high sensitivity and possibility of application in broad mechanistic, kinetic and analytical studies (Mirceski et al. 2013; Guziejewski et al. 2015; Smarzewska et al. (2016); Smarzewska and Ciesielski 2014; Karadas-Bakirhan et al. 2016). New procedure was successfully applied for sensitive determination of profluralin in environmental, water and soil samples. Moreover, interaction between profluralin and double-stranded DNA, dsDNA was explored. All voltammetric experiments were carried out using a μAutolab Type III from Eco Chemie, the Netherlands, with GPES software, i.e. General Purpose Electrochemical System, version 4.9. A classical three-electrode system consisting of a reference electrode, i.e. Ag/AgCl/3 mol L−1 KCl, a counter electrode—Pt wire, and a working electrode, i.e. a renewable silver amalgam film electrode from mtm-anko, Cracow, Poland, was used. The construction details and properties of the working electrode have been described previously (Baś and Kowalski 2002). Quantitative measurements were performed using square-wave voltammetry or square-wave adsorptive stripping voltammetry techniques and the standard addition method. The amalgam film of the working electrode was refreshed before each measurement. The refreshing procedure involves two steps: pulling up the silver wire inside the electrode holder through a silver amalgam reservoir and then pushing it back outside. Measurements were carried out in deaerated solutions. Oxygen dissolved in solutions was removed by passing pure argon for at least 5 min prior to each voltammetric scan. All electrochemical experiments were conducted at the ambient temperature of the laboratory. A digital pH/mV/ion meter from Metrohm, 827 pH lab, was used for preparation of the buffer solutions. Water was demineralized in PURELAB UHQ from Elga LabWater, UK. Profluralin standard 99% was purchased from Dr. Ehrenstorfer GmbH. All the chemicals used for preparation of buffer solutions were from POCH, Poland. Surfactants sodium dodecyl sulphate and cetyltrimethylammonium bromide and dsDNA, e.g. double-stranded salmon sperm deoxyribonucleic acid, were purchased from Sigma-Aldrich. Organic solvents were supplied by Avantor, Poland. Solutions were purged with pure argon, Linde Gas, before voltammetric analyses. A fresh stock solution of 1 mmol L−1 profluralin was prepared weekly by dissolving 3.47 mg of the compound in 10 mL of ethanol. Working solutions of lower concentrations were freshly prepared by the appropriate dilution of the stock standard solution. dsDNA solution was prepared in PBS buffer pH 7.4. Britton Robinson buffers of different pH values were made by the addition of 0.2 mol L−1 sodium hydroxide to mixture of phosphoric, boric and acetic acid, 0.04 mol L−1 of each acid. The final pH was checked using a pH meter, Metrohm. The samples: Ner river water, tap water and soil from Rawa Mazowiecka, central Poland, were used without any pre-separation or pre-concentration. Spiked tap and river water solutions were prepared as follows: 1 mL volume of profluralin appropriately diluted stock solution was transferred to a 10-mL flask and filled up to the mark with tap or river water. Final concentration of profluralin in tap and river water samples was equal to 1.0—sample A, 10—sample B and 100 µmol L−1—sample C. Spiked soil samples were prepared as follows: appropriate amount of profluralin working solution was added to 5 g of samples 1 and 2 or 10 g of sample 3. The samples were left to dry in the dark. Subsequently, 5 mL of ethanol was added to the samples, vigorously mixed for 10 min and then filtrated. Final concentration of profluralin in soil samples was equal to 0.1, 1.0 and 10.0 ppm for samples 1, 2 and 3, respectively. To record the square-wave and square-wave adsorptive stripping voltammograms of the spiked samples, 1 mL of the above sample solution was transferred into the voltammetric cell containing 9 mL of the supporting electrolyte. Successive additions of profluralin standard solution were added to the electrochemical cell with a micropipette. The profluralin concentration in spiked samples was analysed using the standard addition method. Voltammograms were recorded after each addition. Recoveries were calculated after three replicate experiments. The choice of supporting electrolyte is an important stage in electrochemical studies. The composition of the supporting electrolyte affects the properties of the solution and the solution–electrode interface, which influence the kinetics and thermodynamics of the charge transfer process (Kissinger and Heinemann 1996). The effect of various supporting electrolytes such as borax and Britton–Robinson buffers on the profluralin peak current was investigated using the silver amalgam film electrode. Reduction signals of the profluralin were not observed in pH lower than 6.5 in the examined potential range. The highest profluralin signals were observed in Britton–Robinson buffer pH 8.5, see Fig. 1a, which was chosen for further studies. With increasing pH, profluralin signals shift towards more negative potentials. 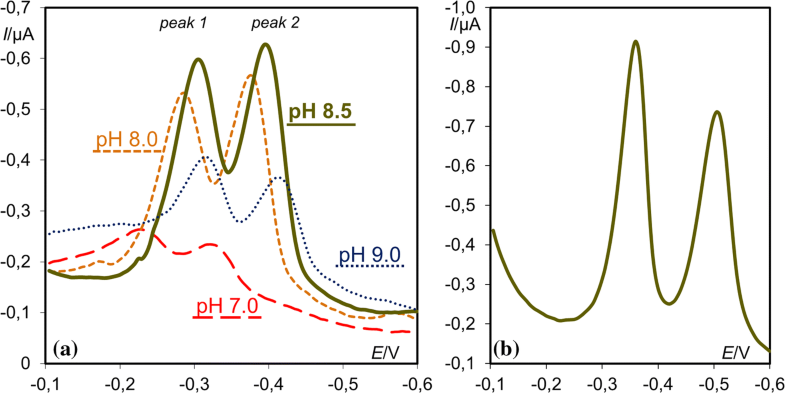 The plots of Ep versus pH were found linear in the examined pH range with slopes equal to 52 and 55 mV pH−1 for peak 1, Ep ca. 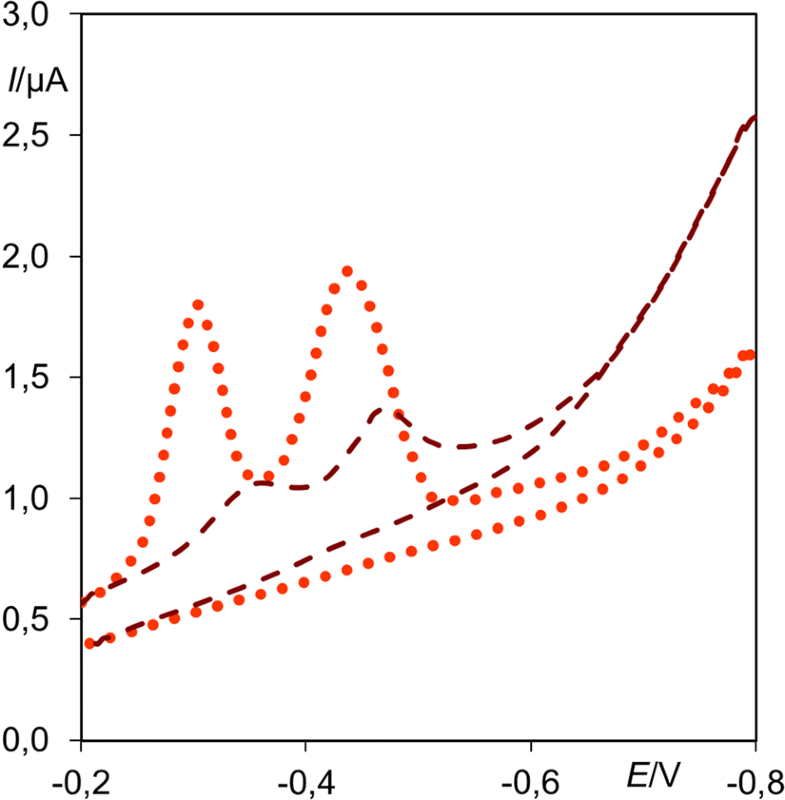 − 0.3 V and peak 2, Ep ca. − 0.4 V, respectively. These values are very close to theoretical value of 59 mV pH−1, so it can be assumed that the examined signals resemble processes in which equal numbers of protons and electrons are involved. As the standard solution of profluralin was prepared in ethanol, it was examined whether addition of ethanol, e.g. 0.1–30%v, to supporting electrolyte influences the morphology and height of observed signals. It was observed that the highest signals were recorded when supporting electrolyte contained 10% of ethanol. In the next step, the possibility of separation of superimposed profluralin signals was examined. Various surface-active compounds were tested for this purpose (Guziejewski et al. 2017). Better separation of peaks was achieved when cetyltrimethylammonium bromide was used. It was found that the optimal amount %v of cetyltrimethylammonium bromide in supporting electrolyte is equal to 2%, i.e. ccetyltrimethylammonium bromide = 1 mmol L−1; see Fig. 1b. This phenomenon is connected with adsorption of surface-active compound at the electrode surface, which leads to the structure changes in the electrode/solution interface. Depending on the structure and overall charge of the surfactant, some assistance in other molecules adsorption or co-adsorption as well as solvation effects in the aggregates impacts on the changes in analyte redox potentials. Hence, the presence of surface-active compounds provides amelioration of electroanalysis in terms of sensitivity and selectivity. Several literature reports can be found on the use of surfactants (Atta et al. 2007; Corona-Avendaño et al. 2010) for improved analytical features of determination of biologically active compounds. After optimization of supporting electrolyte composition, some selection of square-wave voltammetric parameters was examined as described in Supplementary Material. Also an insight into profluralin electrode mechanism is given therein. After evaluation of redox signals of the profluralin, peak 1 was chosen for analytical purposes. Since the separated peaks are of the same origin, i.e. electrochemical reduction of nitro group, choice between first or second peak was not relevant for analytical studies. Quantitative measurements were performed using square-wave voltammetry or square-wave adsorptive stripping voltammetry, chosen supporting electrolyte and optimal experimental parameters of the electrochemical detection. Calibration curves for the square-wave voltammetric techniques were constructed by plotting the peak current against the profluralin concentration. The cathodic peak current increased linearly with the concentration of profluralin from 0.4 to 7.0 µmol L−1, see Fig. S3a, and from 60 to 800 nmol L−1 for square-wave voltammetry and square-wave adsorptive stripping voltammetry, respectively. The characteristics of the calibration plots are provided in Table 1. The limits of quantification, LOQ and detection, LOD were calculated from the calibration curves as kSD/b, where k is 3 and 10 for LOQ and LOD, respectively, SD is a standard deviation of the intercept, and b a slope of the calibration curve. The reliability of the proposed methods was investigated by assaying this herbicide in tap water, river water—Ner and soil samples. Series of spiked samples were used to further evaluate the accuracy of the proposed method. Standard addition method was used to determine profluralin in spiked samples. Example of obtained square-wave voltammetric responses for soil sample is shown in Fig. S3b. As can be seen, components of the sample do not interfere with the voltammetric peak of profluralin. The data related to the recovery curves in tap water, river water and soil samples are shown in Table 2. Values of recovery, calculated for all the samples, pointed that the components of the matrices do not affect the analytical sensitivity. Therefore, it can be concluded that the proposed procedures can be easily and successfully employed in the determination of profluralin. Since the concept of intercalation into DNA was first formulated by Lerman in 1961 (Lerman 1961), it has become widely recognized that many biologically active compounds correlate their biological activities with the ability of interaction with DNA (Waring1972). Interactions between DNA and chemical and physical agents, present in the environment, often result in mutations of the DNA nucleotide sequence (Blackburn and Gait 1990; Zhang et al. 2012). Plant protection products, dyes or compounds responsible for air pollution are just some examples of chemicals which may interact with DNA. In electroanalysis, such interaction may be also utilized for DNA determination. Since profluralin is very toxic to aquatic organisms, double-stranded DNA, i.e. dsDNA, isolated from fish sperm was chosen to examine the interaction between profluralin and DNA. In the presence of dsDNA, profluralin signals decreased and shifted to more negative potential values, e.g. Fig. 2, indicating the electrostatic binding mode (Xu and Bard 1995; Carter and Bard 1987). Profluralin signal loss may be caused by change in the equilibrium concentration of free profluralin because of profluralin–dsDNA interaction (Erdem and Ozsoz 2001) or due to formation of profluralin–dsDNA adduct with large molecular weight with subsequent decrease in the apparent diffusion coefficient (Wang et al. 2003). Linear dependence between peak current and scan rate was observed for profluralin and profluralin in the presence of dsDNA. Linear dependence, namely Ip [μA] = 5.73 × 10−3ν [mV s−1] + 0.134 [μA], R2 = 0.980 and Ip [μA] = 1.31 × 10−3ν [mV s−1] + 0.597 [μA], R2 = 0.999, respectively, indicates adsorption-controlled nature of both observed phenomena. This evidence was confirmed with the linear logarithmic plot Ip versus v. Therefore, profluralin and profluralin–DNA complex adsorption at the working electrode surface can be assumed (Nosal-Wiercińska et al. 2018). According to observed phenomena, it was examined whether profluralin–dsDNA interaction may be used to develop dsDNA determination method, where calibration curve is based on profluralin signal loss caused by increasing dsDNA concentration. It was stated that indirect determination is possible in the range from 1.0 to 10.0 ppm of dsDNA, e.g. Fig. S4. Dependence between recorded peak current and dsDNA concentration can be described with calibration curve Ip [A] = –6.02 × 10−8 [A ppm−1]·cdsDNA [ppm] + 6.00 × 10−7 [A]. Limit of detection and limit of quantification were estimated as shown in the previous section. Limit of detection (LOD) and limit of quantification (LOQ) were found to be 0.17 and 0.57 ppm, respectively. Further information on the interaction between profluralin and dsDNA is given in Supplementary Material. We have demonstrated that the tested herbicide is electrochemically active at a silver amalgam film electrode. Electrochemical reduction of profluralin is irreversible and controlled by an adsorption. The voltammograms recorded in the alkaline medium of Britton–Robinson buffer of pH 8.5 consisted of two cathodic signals associated with the reduction of nitro groups in the profluralin molecule. Addition of cetyltrimethylammonium bromide surfactant enabled the separation of overlapping signals, and it was possible to develop electroanalytical procedure for profluralin determination in concentration ranges of 0.4–7.0 µmol L−1 and 60–800 nmol L−1 using square-wave voltammetry and square-wave stripping voltammetry, respectively. The method was also applied successfully in the determination of profluralin in soil and water samples. High sensitivity, low detection limit and very good repeatability together with excellent recovery make the silver amalgam film electrode suitable for accurate determination of profluralin in environmental samples. In comparison with our previous publication (Smarzewska et al. 2017c), we have found that using those new conditions, linear response towards profluralin determination can be significantly extended. Moreover, using the developed method, difficulties connected to overlapping signal may be omitted with the use of surfactant. Additionally, we have proposed a possibility of determination in the new type of environmental sample that was not possible before. It can serve as an alternative to expensive chromatographic methods for routine analysis of environmental samples at least for screening purposes. Moreover, as profluralin is highly toxic to fish, its interaction with double-stranded DNA, i.e. dsDNA, isolated from salmon sperm was examined. Those studies have shown that interaction between profluralin and dsDNA takes place via electrostatic binding mode. It was revealed that dsDNA forms complex where four molecules of profluralin are attached to DNA strand. Values of binding constant and Gibbs free energy change degree revealed that such complex is stable and its formation is a spontaneous process. It was also stated that decrease of profluralin signals in the presence of dsDNA may be used for indirect determination of dsDNA with LOD of 0.17 ppm. This work was supported by the University of Lodz, Poland, under Grant for young investigators No. B1711100001602.02.